Tarımsal üretimde çevre dostu üretim tekniklerine uyarak sağlıklı ürün eldesi son yılların başlıca konusu haline gelmiştir. Bitkisel üretim sürecinde sağlıklı üretim materyali temini tarımsal üretimin en önemli ön koşulları arasında yer almaktadır. Ozon yüksek oksidasyon yeteneği ile çok kuvvetli bir dezenfektandır. Bu özelliği sayesinde birçok sektörde genel dezenfektan olarak ve farklı amaçlarla kullanılmaktadır. ﻿Uygulama öncelikle 100-150 mg O3/Nm3 ve 1 saat muamele olarak şekillenmiştir. Söz konusu doz ve sürede ortama uygulanan ozon gazı mevcut mikrobiyolojik yükü tümüyle eradike etmiştir. Ozon gazının 75 ve 85 mg O3/Nm3 dozlarının 1 saat uygulanması ile de ortam atmosferi ve yüzeylerde mevcut mikrobiyolojik kontrol altına alınmıştır. Artan ozon dozu ile mikrobiyolojik yük arasında kuvvetli negatif ilişki belirlenmiştir. Benzer etki metal yüzeylere suni olarak bulaştırılan Fusarium oxysporum f. sp. lycopersici propagüllerinin dezenfeksiyonunda izlenmiştir. In agricultural production, it has become a main topic in recent years to obtain healthy crops in accordance with environmental friendly production techniques. The most important prerequisite for agricultural production is the provide of healthy plant production material in process. Ozone is a very strong disinfectant with its high oxidation ability. With this feature, it is used as general disinfectant in many sectors and for different purposes. In this study, the possibilities of using ozone for the general disinfection of indoor environments of plant nursery facilities which are provide material to open field and greenhouses were investigated. The research has been carried out by applying high-dose ozone in gas forming for a short time in Indoor with intensive microbiological load. The treatment at 100-150 mg O3/Nm3 and one hour has completely eradicated the microbiological loads present. The microbiological loads on the cabin atmosphere and surfaces was also controlled by applying ozone doses of 75 and 85 mg O3 / Nm3 for 1 hour. There was a strong negative correlation between increased ozone dose and microbiological load. A similar effect was also determined on the disinfection process of artificially inoculated with Fusarium oxysporum f. sp. lycopersici propagules. Adams, R.I., Miletto, M., Taylor, J.W. and T.D. Bruns, 2013. Dispersal in microbes: fungi in indoor air are dominated by outdoor air and show dispersal limitation at short distances. The ISME (International Society for Microbial Ecology) Journal 7:1262–1273. Balkaya, A, Kandemir, D. ve Ş. Sarıbaş, 2015. Türkiye sebze fidesi üretimindeki son gelişmeler. TÜRKTOB Türkiye Tohumcular Birliği Dergisi, 4(13): 4-8. Güzel-Seydim, Z.B., Greene, A.K. and A.C. Seydim, 2004. Use of ozone in the food industry. Swiss Society of Food Science and Technology. Published by Elsevier Ltd. Lebensmittel Wissenschaft und-Technologie, 37: 453–460. Habibi-Najafi, M.B. and M.H. Haddad-Khodaparast, 2009. Efficacy of ozone to reduce microbial populations in date fruits. 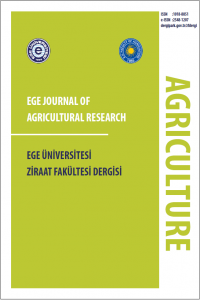 Elsevier Ltd. Food Control 20:27–30.Hill, A.G. and R.G. Rice, 1982. Handbook of Ozone Technology and Applications. Volume 1. Ann Arbor Science, Ann Arbor MI. p 1-37, 4 fig, 4 tab, 141 ref.Hudson, J.B., Sharma, M.and S. Vimalanathan, 2009. Development of a Practical Method for Using Ozone Gas as a Virus Decontaminating Agent. Ozone: Science & Engineering, 31: 216–223. Li, C.S. and Y.C. Wang, 2003. Surface Germicidal Effects of Ozone for Microorganisms. AIHA Journal, 64 (4), 533-537.Masanao, Y, 2001. Technological examination on the sanitation of chicken ranch and a case of HACCP system introduction (5), Animal Husbandry, ISSN:0009-3874, 55:(2) 270-272. Menetrez M.Y., Foarde, K.K., Schwartz, T.D., Dean, T.R.and D.A. Betancourt, 2009. An Evaluation of the Antimicrobial Effects of Gas-Phase Ozone” - Ozone: Science & Engineering, 31: 316–325. Ozonecip, 2005. Study of the ozone technology, Public Report, The OZONECIP Project is co-funded by the European Union’s Life Environment Programme, 18 p.
Pryor, A, 2001. Field trials for the combined use of ozone gas and beneficial microorganisms as a preplant soil treatment for tomatoes and strawberries. Pest Management Grants Final Report. Contract No. 99-0220 California Dept. Pesticide Regulation. 18 pp. Sandermann, H., 1996. Ozone and Plant Health. Annual Review of Phytopathology. 34:347-366. Smith, D.J., Timonen, H.J., Jaffe, D.A., Griffin, D.W., Michele B.N., Perry, K.D., Ward P.D. and M.S. Roberts, 2013. Intercontinental dispersal of bacteria and archaea by transpacific winds. Applied and Environmental Microbiology, 79 (4):1134-1139. Venta, M. B., Cruz Broche, S. S., Torres, I. F., Perez, M. G., Lorenzo, E. V., Rodriguez, Y. R.and S. M. Cepero, 2010. Ozone Application for Postharvest Disinfection of Tomatoes. Ozone: Science & Engineering, ISSN: 0191-9512 print / 1547-6545 online, DOI: 10.1080/01919512.2010.508100, 32: 361–371. Yamamoto, H., Terada, T., Naganawa, T. and K. Tatsuyama. 1990. Disinfectious effect ozonation on water infested with several root-infecting pathogens, Ann. Phytopath. Soc. Jpn. 56: 250-251.